29 Jan Rescued from the Chinese Dog Meat Trade! 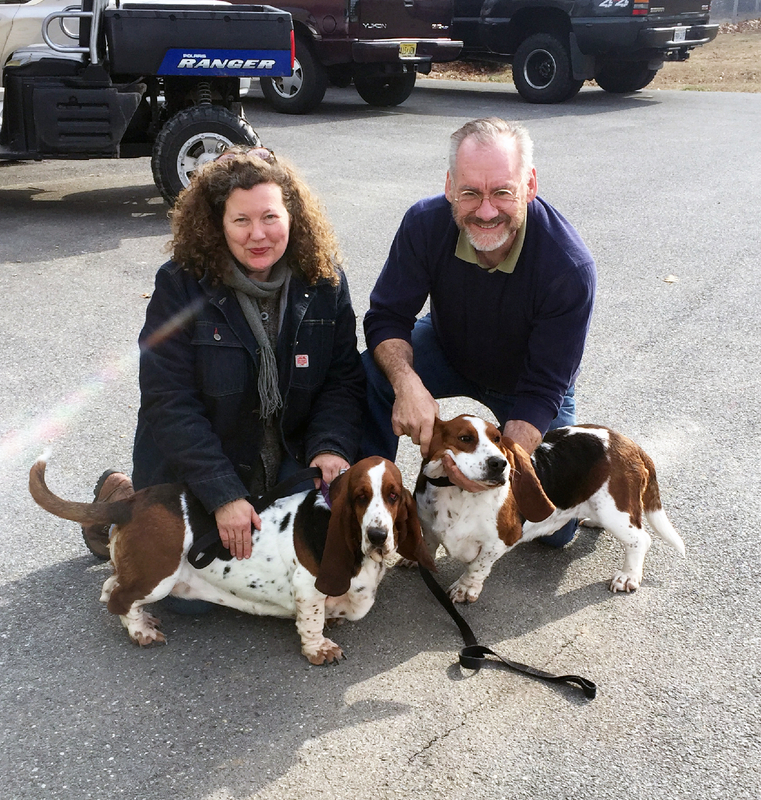 Jill and I adopted two, gorgeous basset hounds last weekend. They’re a “bonded pair,” two dogs who have grown close and are loathe to be separated. Since losing our American bulldog this fall, and our little basset hound last spring, we’ve been looking for new dogs. I didn’t really want a rescue because rescues come with problems, emotional or physical or both. Jill decided we needed another basset hound—the fourth for us. We’re pretty choosy because we need a dog that is both people- and cat-friendly and housebroken. Bassets are hound dogs, second only to bloodhounds in their sensitivity to scent. That means, once a basset is onto an interesting smell outside, it’s gone—wandering, snuffling sniffing, living life large in the wide world. 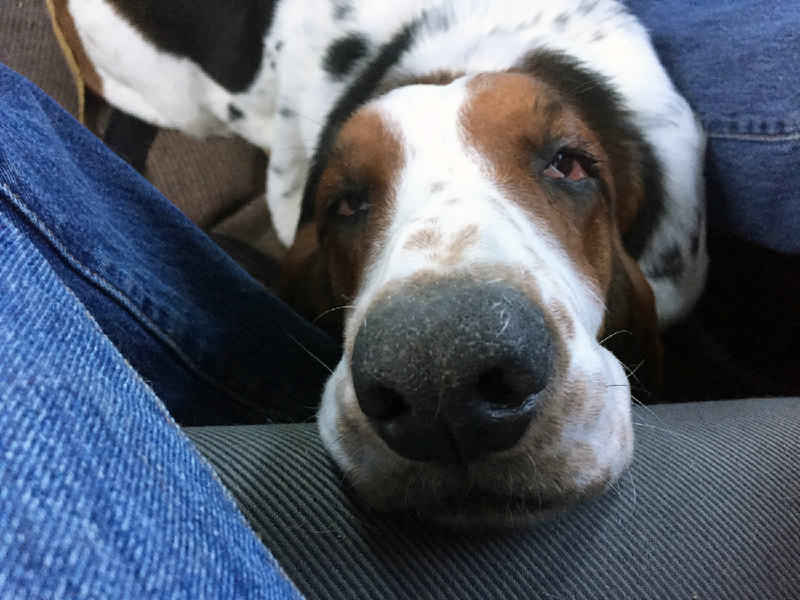 Bassets are famously stubborn too. They’re hard to housetrain. They’re also mischievous. They’re fond of counter-surfing but sneaky about it. So you might enter the kitchen and sense something’s amiss but only later come to realize that, hey, the new loaf of bread—which was sitting on the counter—has disappeared, wrapper and all. The unique thing about our pair is that they are rescues from the Chinese dog meat trade. I didn’t even know there was such a trade. But eating dog meat is a big thing in most of Asia—from Korea to Vietnam. Our two—Oliver and Maisie—were destined for the notorious Yulin Dog Meat and Lychee Festival in June. Approximately 10,000 dogs are slaughtered for this festival alone. Although many of these dogs are stolen, many others are sold to the meat dealers by families who can no longer afford to keep their dogs. The problem with the meat festival isn’t that these dogs are being eaten—it’s that they are being cruelly treated, even tortured before slaughter. Let’s be honest and acknowledge that different people in different cultures eat different things—guinea pigs in South America, for example. The history of eating dog meat goes back at least 4,000 years. Nonetheless, millions of Chinese now protest against the practice. 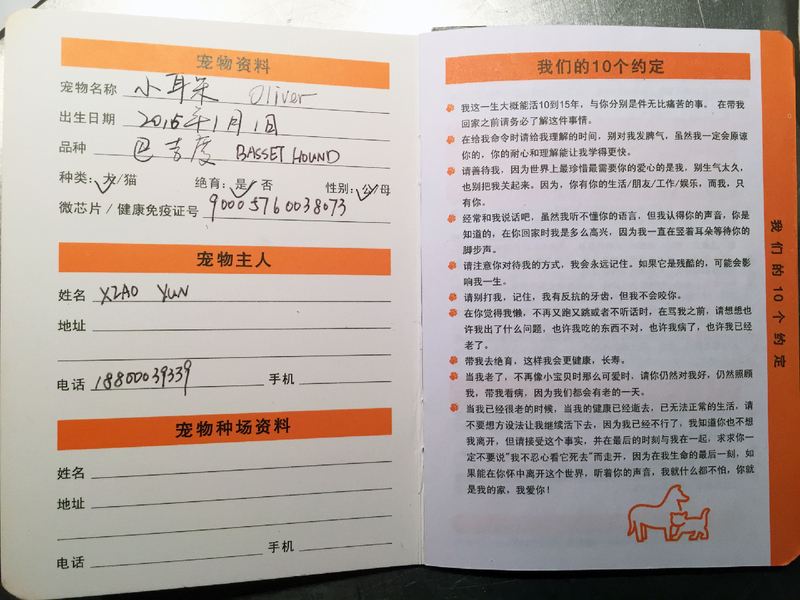 In recent years, American dog rescue groups have been buying dogs from Chinese meat dealers and flying them back to the U.S. for rehabilitation and adoption. The dogs are cheap, sold live and bought by the pound, like chicken. 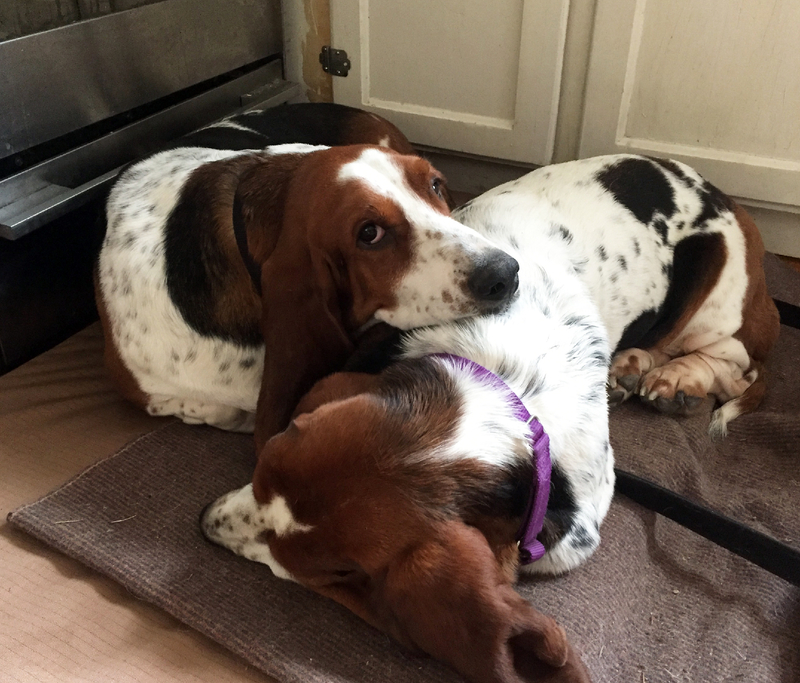 Our two bassets–from TriState Basset Rescue in New Jersey–are pedigrees, a couple of the prettiest we’ve ever seen–and were raised (in China) as breeders and then sold to meat traders probably because the owner was desperate for cash. 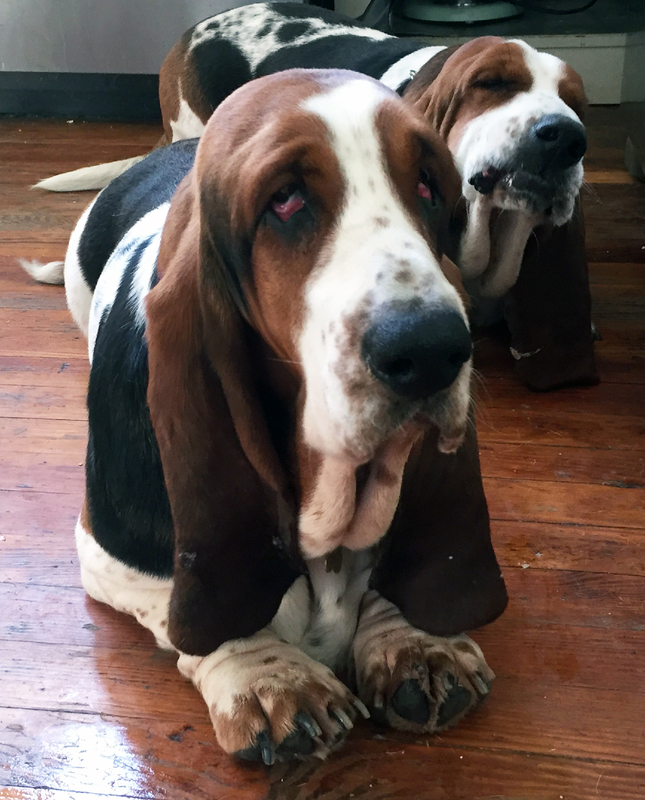 The great thing about bassets is that they are easy-going and quite adaptable. When we drove Oliver and Masie home, they slept most the way. They showed no distress in finding themselves in a new house. But they’re curious and hard to wrangle when they want to explore, because they’re stubborn and not especially smart. On the trail of a rabbit, they’d be hard to catch. Bassets originated in France, where there are 6 distinct breeds. Their name means “really low,” which is what they are, close to the ground to better catch the scent. As it turns out, Oliver snores. And Maisie, when she’s had enough of walking on the leash, simply lies down, which is very bassety. Also: Oliver isn’t housebroken yet, so we watch him carefully. And he’s learning to use stairs, something he’s never experienced. Oh, brave new world!